Exactly 2 hours and 40 minutes south of Seattle there's a little place we consider to be one of our favorite getaways. Whether for a weekend or longer, visiting Willapa Bay, specifically the KOA in Baycenter, always proves to be a worthwhile escape. For years our family has been visiting this well kept campground on the Washington Coast and each time we begin packing up our gear for the journey home, we wish we could stay just one or two more nights. Now there are many ways to "camp" and many places in this great state to do so. For The Oxfords camping is a ritual. From the detailed list my wife begins compiling weeks before our departure, ensuring that while away we'll have all of the comforts of home, to the household chores I insist must be completed prior. Our family has camping down to a science. First, one must begin by choosing the direction in which you plan to travel. Next is deciding on whether or not you'll actually be "camping." That is to say "roughing it." For the traditionalist this requires sleeping in a tent, usually at a slight angle and always on a bed of pine cones or an occasional tree root. Anything less is unacceptable. However, the back of a van is sometimes permissible. Others may choose a more comfortable way of communing with nature. Some call this "Glamping," which until recently is a term with which I was unfamiliar. I suppose the name is derived from the assumption that relying on a 5th Wheel Trailer, RV or Cabin is more "glamorous" than tent camping. This indeed may be true. Regardless however, I encourage you to seize an opportunity to drag the kids away from the video games and get out and explore this home we affectionately call the Great Northwest. Now some people simply don't like to camp. They may prefer resort hotels, cruise ships or "staycations" and that's perfectly all right. It's not for everyone... thank goodness. Otherwise, I'd never be able to make a reservation and that is something on which I insist. I remember as a child we'd pack up the car and just "take off" and when my Dad got tired of driving, we'd find a campsite. Although in some cases this is still possible, not all campgrounds (usually State or Federal) allow this convenience. I much prefer having a spot reserved -- one I've either stayed in before or one I've investigated thoroughly. Being sandwiched between two giant motorhomes can spoil an outing rather quickly. This has happened in the past and to be honest, sleeping with generators running on both sides of you all night is not the best way to enjoy the "sounds of nature." Thankfully, most campgrounds have areas designated specifically for tent camping and RV'ing. We have a pop-up trailer that has served us well for many years, but because this was going to be a short three day trip, we decided to rent a Yurt. This particular KOA has a few comfortable little cabins which we've also rented in the past, but the Yurts are a welcome new addition. We first chose Baycenter in order to try our luck at clamming. The entire family loves seafood and Willapa Bay is best known for its fresh oysters and shellfish. Ken and Iris Shupe own and operate the Baycenter KOA and they'll tell you when checking in that the WiFi is "spotty." At this your teenagers will probably groan, but soon they'll forget all about Facebook Status Updates. The clamming is rather easy and for a minimal fee, if you didn't bring your own, clam buckets and rakes can be rented. 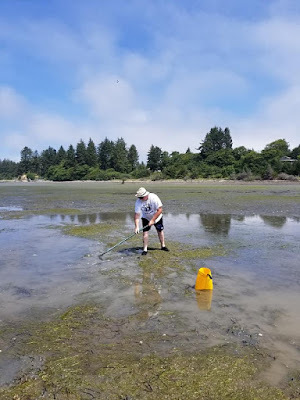 Ken and Iris are also happy to provide a lesson in Clamming 101 for those first timers and a short trip to the beach at low tide can provide an ample supply of steamers for dinner. Yum! For the younger campers, the Shupes have been steadily providing more and more activities in the eight years they been running the Baycenter KOA. RC cars and a delightful track on which to race them is a new addition since our last stay. As is the ice cream shoppe, volleyball court, and scavenger hunt. The store is open year round and is well stocked with a variety of essentials for campers and locals alike. The Baycenter KOA also has a game room, but you no longer need quarters. This game room provides only the classics like checkers, chess, Battleship and Candyland. A welcome return to the basics of family fun. If you do find that the little natives are getting a bit too restless or if you feel the need to stimulate the local economy further, 30 minutes away is Long Beach where you'll find lots of restaurants, gift shops, activities for the kids and the World's Longest Beach on which to stroll. Finally, rest assured that while staying at the Baycenter KOA, your family is safe and secure. Protection is provided by Gnomeland Security.